Galactic nuclei are teeming with black holes. Earlier this year, 12 X-ray binaries were discovered at the Milky Way’s center which suggested that thousands of black holes may be hiding in that region. A recent study shows that these stellar black holes are expected to orbit in a disk around the central supermassive black hole. Observations show that the centers of most galaxies harbor a supermassive black hole. The immense gravity of these objects acts to collect a dense population of millions of stars and several thousands of stellar mass black holes within a few light years. Astrophysicists simulated the interactions of stellar orbits in these regions and found that the black holes settle in previously unexpected structures. The results show that the more massive objects of the stellar population form a thick disk structure around the supermassive black hole in galactic nuclei. “Previously it was thought that the orbits of both light and massive stellar objects are distributed isotropically around the supermassive black hole. We now understand that massive stars and black holes typically segregate into a disk,” said Ákos Szölgyén of Eötvös University, Hungary, who led the study that has been published in the journal Physical Review Letters. Szölgyén and his PhD advisor Bence Kocsis at Eötvös University, Hungary, incorporated an important additional effect in their simulation, namely vector resonant relaxation. This effect represents a small component of the gravitational torque among the orbiting objects which accumulates over millions of years and becomes dominant over long timescales. As a consequence the orbital planes of objects around the supermassive black hole turn slowly. “Unlike a swarm of bees around a beehive, stars fly around in the galactic center in a more ordered way: along precessing elliptical trajectories, each confined to a plane, respectively. The interactions among such planar orbits slowly reshuffles their orientations over millions of years,” explained Bence Kocsis. Researchers simulated the interactions of stellar orbits in nuclear star clusters throughout cosmic history since their formation. “According to our current knowledge, nuclear star clusters may form in two different ways. The first suggests that gas flew into the center of the Galaxy and formed stars in situ around the supermassive black hole. The other model assumes that ancient globular clusters spiraled into the Galactic center where the tidal forces of the supermassive black hole tore them apart and populated the central region with their stellar content. It is likely that both processes were equally important in the formation of the nuclear star cluster,” said Ákos Szölgyén. In both models, the initial stellar orbits formed disks around the central supermassive black hole. The orientation of these disks is set by the direction from which the gas or the infalling globular clusters approached the center. With time these disks of stars gravitationally interact and the earlier assumption was that they ultimately dissolve. However the more massive stars, which ultimately turn into black holes, sink to lower inclination orbits in the disk similar to how the more massive particles sink to the bottom of a container. The physicists discovered this phenomenon in the simulations and found that the disks of massive objects may be long-lived. They also investigated what happens with the light and intermediate mass stellar objects in this region. While the orbits of intermediate mass objects, like B-type stars, showed a small amount of anisotropy, the calculations showed that the light objects, such as old main sequence stars like the Sun, neutron stars, and white dwarfs behave fundamentally differently. 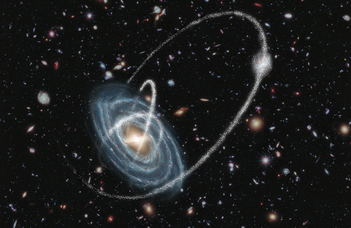 The light stellar objects reached a spherical distribution in the galactic nucleus in the simulation. These results are consistent with the observations of the Milky Way’s center in the vicinity of the central supermassive black hole with a spherical population of old low mass stars, an anisotropic distribution of B-stars, and a warped disk of young massive stars. Although there is only a dozen known black hole candidates in the Galactic Center, the researchers conclude that the black holes, which are typically more massive than stars are hiding within the disk of massive stars. The discovery can have important implications on the understanding of stellar dynamics of galactic nuclei, galaxy evolution, and the origin of gravitational waves. This research has been funded by the European Research Council (ERC) under the European Union’s Horizon 2020 research and innovation programme and by the Hungarian National Research, Development, and Innovation Office (NKFIH).